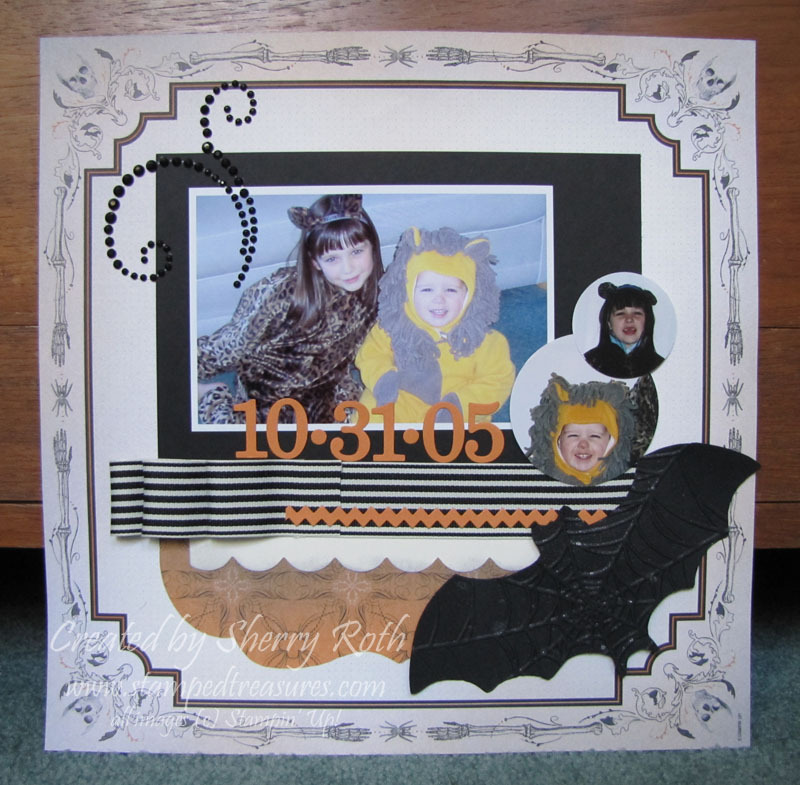 As mentioned yesterday I have another layout to share with you today - a Halloween one. I can't believe these photos were from 2005! Look at these adorable faces - man how they grow up so quickly. I'm finding that I'm missing my babies so I've been scrapbooking a lot more older photos than more recent ones. I've really noticed lately how much my kids have grown up. It's scary to see how much Jordyn has grown up over the past year but even my baby - he's loosing that baby look in his face - it saddens me. But that's one of the reasons we scrapbook right? To save those memories! Anyway, enough babbling! Remember yesterday I said that I used My Digital Studio to create a template for the stars? 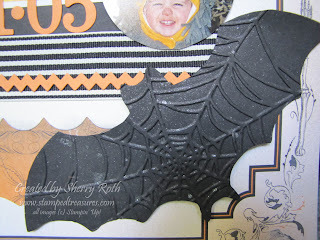 Well I did that here as well - I used the Bat punch and I think it was the Decorative Label punch. The paper that I used was from the Pick Your Poison dsp pack. 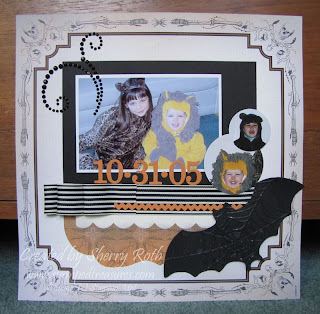 Every year I hesitate to by Halloween paper, I'm not really big into Halloween but I do scrapbook a layout every year of the kids and then also make a few little treats but that's about it. But when I saw this dsp, I fell in love with it AND to make it even better is that on the back of each piece is a neutral pattern. Because of the color combination, this makes for a FABULOUS masculine card paper pack! 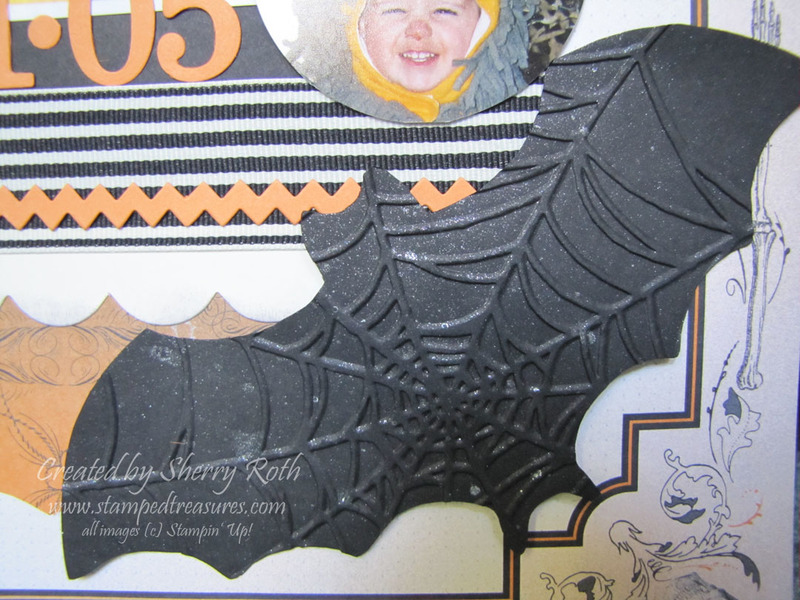 As you can see I used the bat template that I created in MDS to cut out a bat from black cardstock and then ran him through the Big Shot using the spider web impressions folder. If you look closely you can see that I also spritzed him with the silver smooch spritz. I love how he turned out! I think the rest is pretty straightforward but if you have any questions, let me know.